Spending the day at Aruba’s Flamingo Island (Renaissance Island) was the highlight of my trip to Aruba last week, and an experience I’ll never forget. I shared a number of videos of this beautiful island & the flamingos on my instastories – they are still saved under my “travel” highlight if you’d like to see! 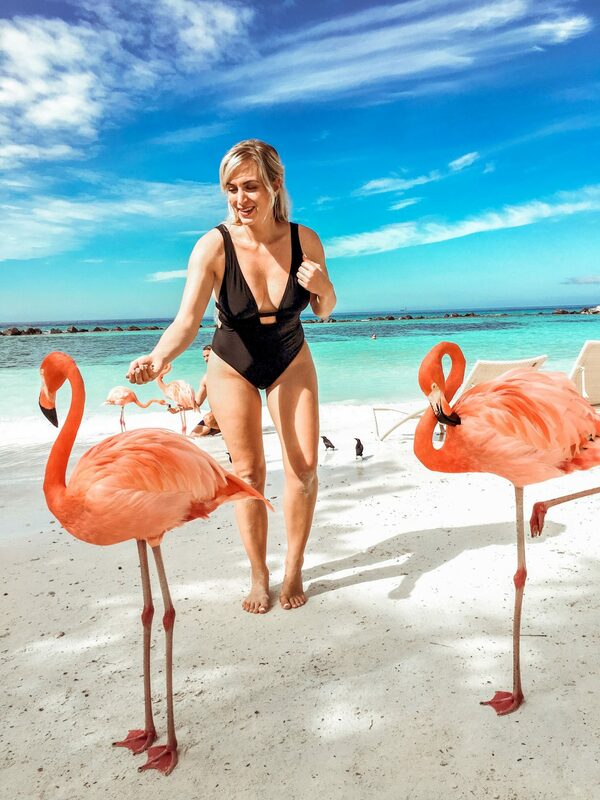 Aruba’s flamingo island was such a hit with my instagram followers, and such a “must-do” if you visit Aruba, that I wanted to dedicate an entire post to everything you need to know about visiting this island. The Aruban flamingos have become quite iconic but I think many people don’t realize that flamingos don’t roam the beaches in Aruba, rather, they are only on this one private island so there are some logistics to sort through if you want to see them. Before I get to all the info, I’ve received a number of comments about my swimsuit and the outfits I wore in Aruba. So, I wanted to share a link to my black one-piece cut out swimsuit (which is on sale) and talk about where I bought my vacation clothes. If you’re on the hunt for some great winter getaway / tropical vacation gear, you need to check out these beach bags, & these travel clothes. 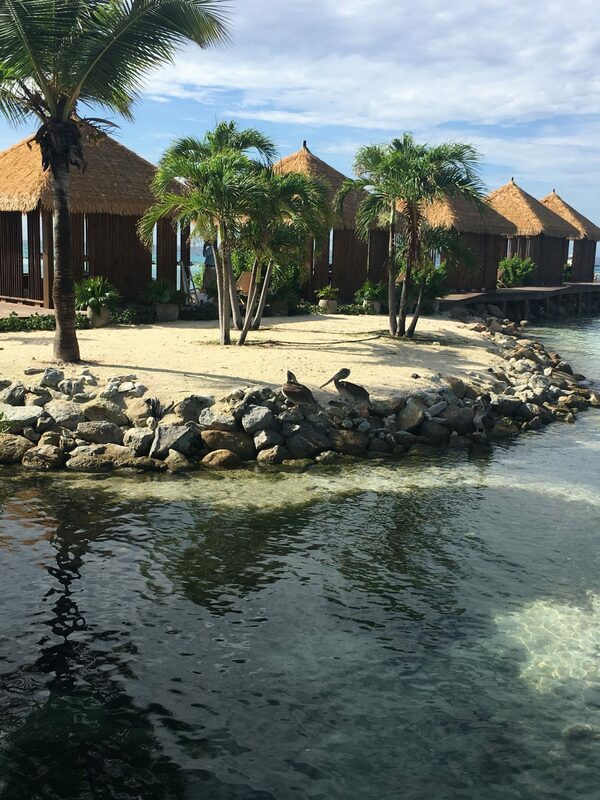 Flamingo Island, as it is colloquially known, is actually the Renaissance Private Island, owned by the Renaissance Hotel Aruba. The Renaissance is not on the beach (it is one of, if not the only, major hotel in Aruba that isn’t) and so they have the island to offer to their guests. Aruba’s flamingo island is an 8 minute boat ride from the main island. It is, quite simply, an island paradise. There are 2 main beach areas, a restaurant, a bar, a nature walk through mangroves, a gift shop and (oddly in my opinion) a gym. There are private cabanas for rent and tons of free beach chairs and hammocks. Attendance at the island is free if you’re a guest at the Renaissance hotel. You can come and go as you please throughout the day. If you are not a hotel guest you can try to visit the island, but it is not guaranteed. Here’s the deal: Every day the Renaissance sells 30 tickets to the island to non-hotel guests. The tickets are not cheap; they cost $100 per person and are given on a first-come-first-serve basis. The ticket price includes your water-taxi trip to and from the island as well as lunch and one drink. You cannot get these tickets in advance, so for the chance to get a ticket to the island you need to show up at the lobby of the Renaissance Hotel around 6:30am on the day you want to go. An employee will come to the desk at 7 am and start selling tickets to the people in line. If you are within the first 30 people, they will sell you a ticket and you can catch the water taxi to the island anytime. If you’re thinking holy cr*p this is ridiculous… you would be right. It is clearly not an ideal system, and you do risk being up and standing in a line at 6:30 and still not getting a ticket. But, if you ask me, the experience of Aruba’s Flamingo Island is worth every bit of this annoying start to the day. On to how to physically get to the island: once you have your ticket, you cross the street in front of the hotel to the marina where you catch the water taxi. Water taxis go to and from the island every 15 minutes. Where are the Flamingos? Are they Worth It? When you get off the boat at the main dock there is a map of the island. You’ll see the two main beaches; iguana beach and flamingo beach. Iguana beach is family friendly and flamingo beach is adult-only. Head over to flamingo beach and there you will find the flamingos. As of the time of this writing there are 6 beautiful pink flamingos that live at this beach. They are wild and so roam around pretty much wherever they feel like, but they are usually in a pack near the water’s edge where you can easily hang out with them. There is food you can buy (25 cents for a handful) if you want to feed them. I was worried that the area with them would be jam packed with people trying to get instagram photos (ironic that I am hating on that, but it is what it is). Luckily, this was not the case. Because the flamingos are milling about, walking in and out of the beach chairs, hanging with people in the water, there doesn’t seem to be much of a ‘mad rush’ to be near them and you can definitely get up close to them and spend time with them (… dare I say; ‘flamingle with them?’ lol) without feeling crowded. So; is it Worth it to Spend $100 To Visit Aruba’s Flamingo Island!? In my opinion; absolutely! I was a bit unsure of what the island would be like – would there be amenities? would we want to spend more than an hour there? Would the included ‘lunch’ just be a packed sandwich? And I was in awe of the experience once I got there. We spent 7 hours on the island, and easily could have been there from sun-up to sun-down. The lunch that is included in the $100 price is any single dish of the restaurant’s menu (… and some meals were $40, so you can really milk it and get your money’s worth if you want) as well as any cocktail. Cocktails ranged from $10-$15 and I had the most amazing pina colada melon swirl. This is a tip for three reasons: 1) Mornings are far less busy so you if you want more privacy and more time with the flamingos, this is your best way to get it. 2) The private cabanas, which are only available to rent if you are a hotel guest, become reserved by that hotel guest at 9am. That means if you go over on the first 7am water taxi you can (sneakily) relax at one of the cabanas for at least an hour and a half. And, 3) Because the island is directly across the water from Aruba’s airport landing strip, it gets really noisy in the afternoon. No flights really land in Aruba before noon, with the majority of plane traffic being between 2 – 5pm. Between 2-5 pm the beach is still great but you are getting the near constant sound of planes flying loudly overhead as they take-off/land. In the morning’s this isn’t a problem! While flamingo beach is adult only, they do allow kids on the beach from 9-10 am when they have employees supervising and feeding the flamingos. So, if you have kiddos, be sure to be there by 9 am so your whole family can have this experience. 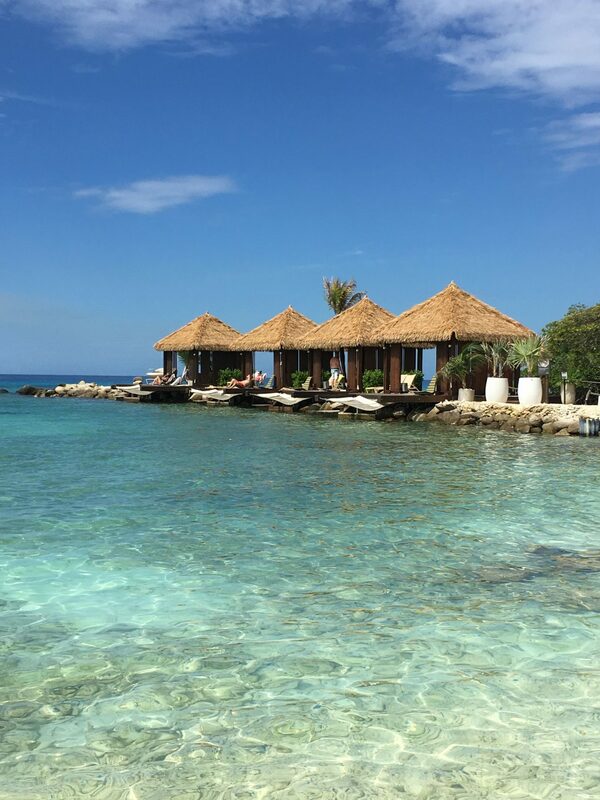 Once it becomes adult only again at 10 am, just head over to iguana beach where kids can play the day away in the water. Tip 3: Find the Other Flamingos! While flamingo beach only has the one flock of (currently) 6 flamingos, there are actually other flamingos on the island! If you keep walking past iguana beach and take the boardwalk all the way down to the end of the island you get into a more private/hidden beach area. Here there is actually another flock of baby flamingos. There were 6 of them when we visited and- be warned they are not the cutest. These flamingos are still grey and honestly a little haggered looking (… much like I looked the morning after drinking too many pina colada melon swirl’s on flamingo island…) So if you are wanting that ‘flamingo for the gram’ shot this isn’t for you, but if you genuinely just want to hang with some flamingos, these babies are so worth the visit. There is no shade on the beaches. I repeat: there is no shade on the beaches. Unlike most beaches in Aruba where they have huts (called Palapas) for shade, Aruba’s flamingo island doesn’t have these. So, be prepared to be in the sun (if you haven’t rented one of the 8 cabanas- again only open to hotel guests to rent). Of course the restaurant and bar (… and gym.. again, why?!) have shade so you can find shade easily on the island – just not on the beach itself. If you are planning on to go to the island with another person it will cost you $200. The cheapest room at the Renaissance is $200. So, while the non-guest tickets do include a meal and drink, it may be worth it to you to just book one night in the hotel to save yourself the whole ‘6:30-am-in-a-line’ businesses. Plus, then you have the ability to rent a cabana if you do want to pay for that. Thanks for reading! If you have any other questions at all about Aruba’s Flamingo Island just leave a comment below and I will answer it asap. I have been to Aruba countless times and I have never been to this island, it looks amazing! These photos are gorgeous and I love your suit! Oh my goodness this is beautiful! I love that you were able to hang out with flamingos, and the beach looks heavenly!! Adding to my list of places to go! Aw that would be amazing! I can only imagine how much little girls would love this! That is cool!! I did not know such a place existed ! I will add this to my list if ever in Aruba. I am getting Paris Hilton vibes in your white heart shaped sunnies – so beautiful! Right! It’s such an amazing spot! And aw thank you, glad you like the sunnies!! This is amazing! had no idea there was a such things as a Flamingo Island. If ever in Aruba, I will be heading there. And so hilarious to read that baby flamingo’s are not cute – lol!! Agreed! Though i do still want to go there! Bookmarking this when we head to Aruba! Very cool! You so do girl, its amazing! oh my gosh I would love to visit Aruba just to go to the beach! This is going on my bucket list for sure. It’s so worth a trip!! This sounds AMAZING! I have never heard of this until now, and definitely want to go now. It’s the best experience. I hope you get to go! The perk of getting a free ticket there if staying at the hotel is awesome!! I would love to visit someday! Isn’t it! You should definitely check it out!! Visiting Flamingo beach has been high on my bucket list FOREVER it seems like! After seeing all your pics I want to book a ticket to Aruba ASAP! You sooo need to go!! Now I want to see the flamingos. Looks like an amazing trip girl. It was the best! Hope you get to go see them!